These .40 S&W cartridges from Federal deliver reliable performance at a reasonable price for target shooting and training purposes. 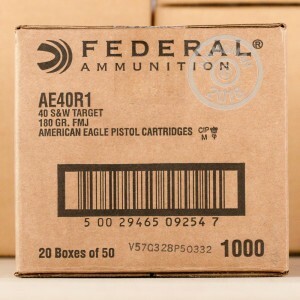 Each round in this box of 50 fires a heavy 180 grain full metal jacket bullet at about 1,000 feet per second, producing typical .40 Smith & Wesson ballistics. 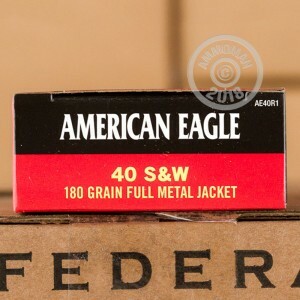 Like other Federal American Eagle ammunition, these cartridges use non-corrosive Boxer primers and brass cases. 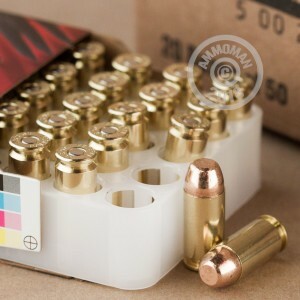 AmmoMan.com is the place to be if you like buying in bulk without paying an arm and a leg for shipping. We provide free shipping on all orders over $99 regardless of package weight!